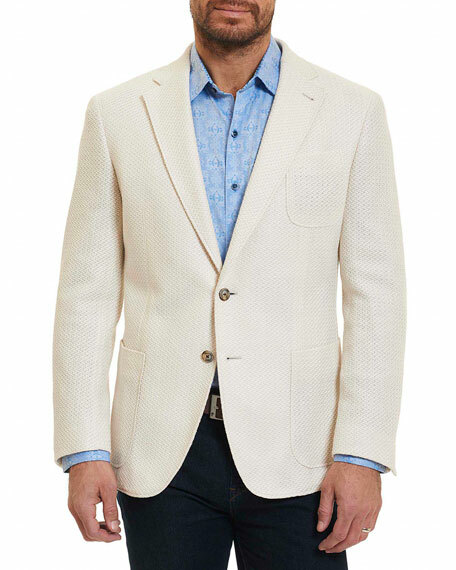 Robert Graham "Lauros" sport coat in loose novelty-weave knit. Patch pockets at left chest and hips. AG "Dart" jacket in stretch-denim. Spread collar; button front. Barrel cuffs. Chest flap pockets. Side slip pockets. Straight hem. Cotton/polyurethane. AG "Dart" jacket in stretch-denim. Spread collar; button front. Barrel cuffs. Chest flap pockets. Side slip pockets. Straight hem. Cotton/polyurethane. Made in Mexico. Model's measurements: Height 6'1"/185cm, waist 32"/81cm, typically wears size M.
J Brand "Acamar" jacket in dark-wash denim. Spread collar; button front. Round barrel cuffs. Chest flap pockets. Side slip pockets. J Brand "Acamar" jacket in dark-wash denim. Spread collar; button front. Round barrel cuffs. Chest flap pockets. Side slip pockets. Straight hem. Cotton/elastomultiester/spandex. Made in USA of Italian material. Model's measurements: Height 6'1"/185cm, waist 32"/81cm, typically wears size M.
Levi Strauss & Co "Type III" trucker jacket in denim with reverse seam detail on the back. Spread collar; button front. Rounded barrel cuffs. Chest flap pockets. Side slip pockets. Straight hem. Cotton. Imported. Rag & Bone "Definitive" jacket in 12-ounce comfort stretch broken twill. Approx. 24.5"L down center back. Spread collar; button front. Rag & Bone "Definitive" jacket in 12-ounce comfort stretch broken twill. Approx. 24.5"L down center back. Spread collar; button front. Long sleeves. Chest flap pocket. Cotton/polyurethane. Made in USA of imported material.